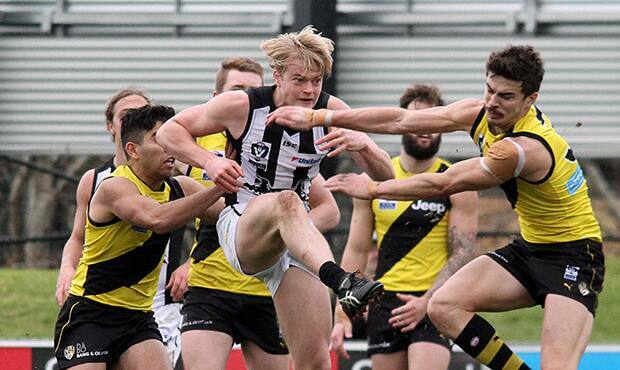 Lachlan Tardrew kicked the match-winning goal for the VFL Magpies at Punt Road Oval. Photo: Shane Barrie. A goal in the dying moments from VFL midfielder Lachlan Tardrew has gifted Collingwood a two-point victory over Richmond at Punt Road Oval. It was a gallant effort from the Magpies after they conceded seven consecutive third-quarter goals to the Tigers. As has been the story in recent weeks, it seemed a third-term fade out would cost the Black and White. But a rev up from coach Jared Rivers at the final break meant the Magpies were as hungry as ever. Trailing the Tigers by 14 points midway through the final term, goals to Mason Cox and Kayle Kirby left the scores level with only minutes remaining. A tantalizing run and carry from Tiger Shae Bolton found Taylor Hunt, who calmly slotted his third goal of the day to give the home side back the lead. The youngster read the ball perfectly from the stoppage; throwing the ball on his boot from 45 metres to split the middle and push Collingwood back in front. And if that wasn’t enough of a fairy-tale, the goal was Tardrew’s first of his young VFL career. The thrilling victory means Collingwood has claimed another top-four scalp, with their finals hopes remaining alive. Tom Phillips was best afield for the Magpies with three goals, while Cox (two goals), Gus Borthwick, Josh Smith and Callum Brown and Jackson Ramsay all starred in the victory. Next week, it’s another test against a traditional rival, as the Magpies meet Essendon at Victoria Park.